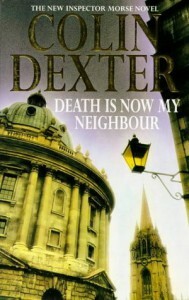 Colin Dexter still at his peak! Book 12/13 and the penultimate novel in the series of murder mysteries confronted by Chief Inspector Morse of Thames Valley Police. And after the sombre tone of “The Daughters of Cain”, a more emollient and less emburdened Morse takes to the fray, centred on the race to succeed Sir Clixby Bream, retiring Master of Lonsdale College, Oxford. There is something immediately intriguing about peering behind the dense curtain surrounding such elites and for the reader it is unsurprising to learn that superficial impressions will prove as important as academic substance. Indeed, for the only two candidates (Julian Storrs and Denis Cornford) the stakes could scarcely be higher, a once-in-a-lifetime opportunity for elevation and preferment expected to culminate in a knighthood. But, for such a prize, ambition and even ruthlessness may be required, to burnish reputations, curry favour with the electorate and suppress unhelpful information. Both contenders also have the dedicated support of a wife, but a crude ‘SWOT’ analysis might conclude that the ‘strengths’ and ‘opportunities’ conferred by their respective partners are at least balanced by the attendant ‘weaknesses’ and ‘threats’. Certainly the vulnerability to be exploited from past mistakes/experiences looms large in this tale, extending even to Morse. However, notwithstanding the opprobrium directed at ‘blackmailers’, as abusers of power, there is also a dearth of sympathy for the disempowered ‘victim’, or the manipulated. What endears Morse to the reader is his candid, but paradoxical unwillingness to defer to authority figures and yet clinging to his own superior status. Only DS Lewis, intermittently coveted as a friend, is thus protected, in spite of outbursts of insubordination and frank observations, intolerable from any other quarter. In this book, Morse also continues to experience deteriorating health and the two detectives are inexorably drawn closer together and in the ultimate, touching confirmation of Lewis’ favoured status, the enigmatic Morse shares his Christian name (via correspondence, of course). Along the way there is the customary flawed hypothesizing, analysis, building and rejigging of the facts, before the final puzzle is expertly revealed. My favourite analogy of Morse’s thought process was of a train passing through a station, too fast to read the nameplate, but as the carriage slows the location may hove into view. Again, Dexter has deftly juxtaposed the traditional façade of high academic establishment with base human behaviour. That the privileged miscreant can be humbled before the law is reassuring, even satisfying. Still, even Morse has limitations to his moral authority and contemptible characters slip through the net, but at least he makes a positive difference. Notwithstanding the CWA daggers liberally awarded throughout this series of books, I think this may yet be my most enjoyable read. Perhaps, not the most complex or devious puzzle, but more for the development of the main characters and the masterful set up for the final book. Bring it on!